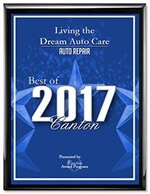 Over the course of two years, Living the Dream Auto Care was required to prove ASE certification, continued customer satisfaction, upstanding community business reputation and ongoing staff training in order to be considered for this designation. The facility is inspected for cleanliness and the prices are assessed for fairness. The comprehensive investigation is designed to take care of the screening process for the consumer, ensuring a stress-free, satisfactory visit when their vehicle is in need. If you are an AAA member, you will enjoy a 10 percent discount on all repairs and maintenance, up to $50. You will also receive a free maintenance inspection involving an in-depth assessment of belts, hoses, tires and any written recommendations on necessary services. When your vehicle is towed to an AAA Approved Auto Repair facility, it’s guaranteed to be looked at within 60 minutes. The shop will also help you find alternate transportation to reach your destination. All AAA members will receive a 24-month/24,000 miles guarantee (whichever comes first) on all repairs and service. This quality guarantee applies to both parts and labor. In case there is ever a repair or service rendered and billed that is under dispute, AAA will step in and investigate the claims leveled against the facility, providing an extra level of protection to the consumer. The facility will accept AAA’s recommendations regarding the claim investigation, though the consumer will not be bound to any decision. Having faith in your car mechanic is part of what it means to live the dream. At Living the Dream Auto Care, we’ve worked hard to earn your trust and we’ll continue to do so as we maintain our AAA Approved Auto Repair status throughout the years. When you need vehicle service, you deserve responsive, professional care with a personal touch, and that’s what you can expect here at Living the Dream.